Albert Bierstadt, The Rocky Mountains, 1863, oil on canvas, Metropolitan Museum of Art, New York, NY. For my final art history credit, I’m taking an Art in American West class this semester. In homage to this class, I figured I should choose Albert Bierstadt’s, The Rocky Mountains, before I’m completely burnt out on 20th century American Art. I’ve learned that study in one specific era always harvests onset Attention Deficit Disorder for me. Anyways, beautiful landscapes of a young America, like Bierstadt's, usually don’t speak to me like, say, Andy Warhol’s pop art. However, with a couple of weeks in this Art in American West class, I’ve been able to gain a new appreciation for this art and I hope to pass some of this onto you. In 1863 when America’s west was an alien-like space, landscape paintings were necessary for further funding and exploration. But artistically, it was like painting a landscape of mars- you could idealize but nothing was definite and often creative liberties were used by the artists. 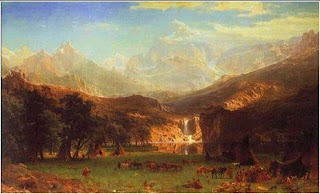 This is an example of a landscape that used classical romanticism style on a new subject matter, mountainous regions and Native Americans. Simply the colors alone represent a cheery perfectionism with the use of warm and bright shades, even though natives were beginning to be pushed out by explorers. In further examination, the Rocky Mountains in the background are painted so subtly and softly that they could be marshmallow-y clouds instead. And in the foreground, the life of Native Americans is depicted. With tepees, horses, and the natives involved in work and play this is a much idealized portrait. Life seems to be in perfect harmony with the natural world. Portraits like The Rocky Mountains, although normally disregarded, were important as they “beckoned” folks from America's east and even Europeans to explore and put down roots in the west. Without these luring landscapes portraits, we'd have no Hollywood or Las Vegas.